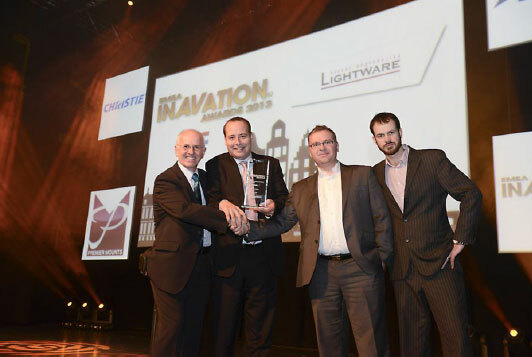 The University of Central Lancashire’s (UCLan) Cyprus Campus has been voted the ‘Most InAVative Education Facility’ at the prestigious Europe, Middle East and Africa (EMEA) InAVation Awards in Amsterdam. Andrea Piemonti, MD of integration company ALA Equipment Co, was on hand to receive the Award at a gala presentation dinner for 500 people, along with Frank Wadmore, Network Team Leader, UCLan. Presenting the trophy was Chris Fitzsimmons, editor of InAVate Magazine, who sponsored the event. UCLan Cyprus was a fast track project that required a specialist company who could work with the University in achieving their goal within a very demanding timescale. ALA was introduced to the project to work with the technical staff at UCLan where they set about enhancing the original concept designs to provide a future proof solution. From planning to implementation this was carried out in just three weeks of the six months building project which was achieved by applying a number of bespoke solutions in the process. “This was the most challenging project we have ever undertaken, due to the tight timescales,” said the ALA MD. “In three days we developed the site from the ground up to give the University a turnkey solution withfull HD capability and simplicity of operation within a highly complex design.” In a fiercely competitive sector, UCLan triumphed at the Awards over 30 competition entrants, as well as shortlisted projects from four other university finalists based in England, the Republic of Ireland and Russia. Commenting on the award Dr Lee Chatfield, UCLan Cyprus Rector, said: “The vision for UCLan Cyprus includes the provision of high quality and future proof IT and AV facilities to support the learning needs of our students as they study for careers in the technologically demanding environment of the 21st Century. We are delighted that, by combining the expertise of our own IT experts in Preston with ALA, our AV contractor in Cyprus, we have turned our vision into technical reality. Aside from the advanced digital tools sourced from leading industry manufacturers, the provision of a video conferencing system which allows for streaming either into or out of Preston, an entrance foyer video wall capable of displaying content up to four times full HD video and the provision of distance learning facilities provided compelling reasons for UCLan Cyprus’s success.